Sprinklers can help businesses, by reducing the impact of a fire. As businesses look to remain competitive in a challenging economic climate, it becomes more important than ever to ensure that key resources are protected, allowing them to continue operating after a fire. It has been suggested that many businesses do not recover after a major fire, and this can have an impact not only on the company itself, but on its employees, customers and suppliers. All our sprinklers will go off every time someone burns the toast, damaging my stock and buildings. Truth: Each sprinkler head is set to operate individually, and it will only be triggered to spray water onto a fire when it reaches its predetermined operating temperature. The predetermined temperature varies, but it’s often around 68°c. That’s 11°c higher than the highest temperature ever recorded in Death Valley, California, and would be hot enough to fry an egg on the pavement. If a fire does start in your business, only the sprinklers in the immediate area of the fire will open – all the others remain closed. Don’t believe the Hollywood action films that show the hero flooding an entire building by holding a lighter to a single sprinkler, it just doesn’t happen in real life! Sprinklers are unreliable aren’t they? Sprinklers are hugely expensive, I can’t afford them. Losses from fires in buildings protected with sprinklers, in comparison, are estimated to be one-tenth of those in unprotected buildings. 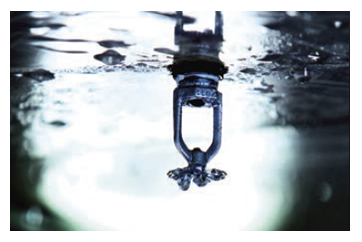 Fitting sprinklers can save you money in some areas – insurers will often offer premium discounts to premises with sprinkler systems, and policy excesses may be lower. Truth: Modern sprinklers can be specially designed to meet your needs and are compact and elegant. The public will often be unaware that sprinklers are fitted, with miniature sprinklers (about the size of a 50p piece) available, which can be fitted with ceiling rosettes and painted to match your colour scheme. Concealed sprinklers are almost invisible – they’re recessed, flush with the ceiling, and covered by a flat plate (ideal for clean areas, areas with restricted headroom, or where vandalism is a potential problem). In fact, including sprinklers in the specification for an unconventional or unusual building design can often offer design freedoms while still achieving Building Regulations compliance cost-effectively. Sprinklers may also mean that you can reduce the amount of visible, portable fire-fighting equipment that you need to have. And, while you think you might not be a target for arson, there were 9,910 fires started deliberately in 2012/13, with over 3,063 of these in premises including industrial and retail buildings and schools. 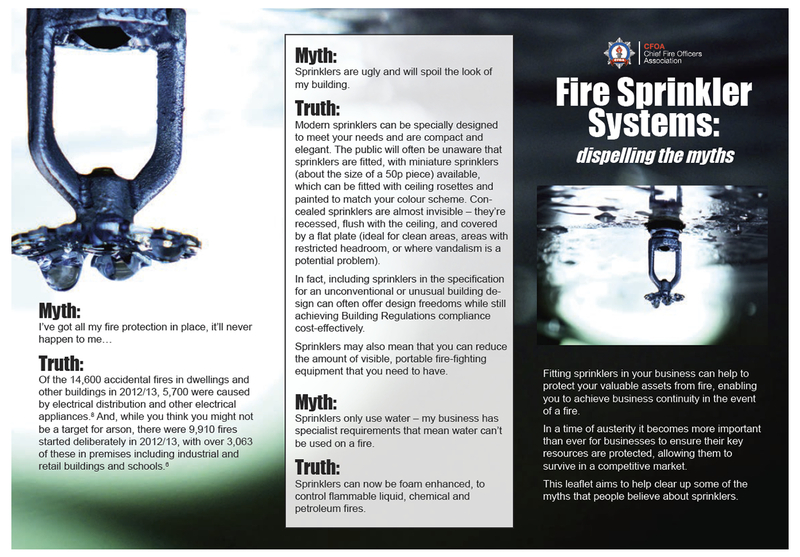 Sprinklers only use water – my business has specialist requirements that mean water can’t be used on a fire. Truth: Sprinklers can now be foam enhanced, to control flammable liquid, chemical and petroleum fires.